Did you know that more than 10 million people play sport each week in the UK across 150,000 clubs? It is a striking statistic and Christians in Sport are passionate about helping the Church reach out to these sportspeople with the gospel. Now they have made available a new collection of resources to do just that. It includes a multimedia sports quiz, plans for school assemblies and lessons, guides on how to run sports tournaments, a new evangelistic film and much more. The new pack updates and builds on last year’s debut release. 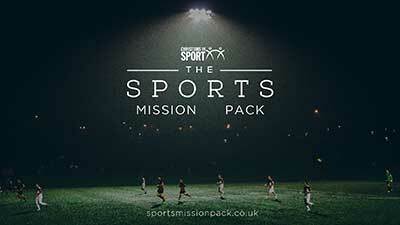 Ian Lancaster, Christians in Sport’s UK Team Leader, said: “We want to reach the world of sport for Christ and believe that the Sports Mission Pack can help play a big part. This is a resource that will help Christian sportspeople and churches, who are engaging in their local clubs and teams, share the gospel with some of the millions of sportspeople in this country. The pack contains everything churches and Christian groups need to put on a variety of events and encourage their congregations to get involved. The staff team are also able to provide support at events, so those who download the pack are encouraged to get in touch if that is something they would like. 2017 is shaping up to be another massive year of sport and there are loads of big events to link the resources to, such as the Six Nations, Wimbledon, the British & Irish Lions rugby union tour and the World Athletics Championships in London. Churches could run a sports quiz during Wimbledon or mark the Lions’ visit to New Zealand by hosting a tag rugby tournament. However, the resources in the Sports Mission Pack can really be used at any time.